In this chapter the full family trees are published. This branch goes back to the year 1600 and is thereby the oldest known and longest lineage. Descendants of Hans Giegengack, who died in Kleinschmalkalden in Thüringen, still live in Germany and also in the USA. The family members in the USA all stem from Johann Martin Giegengack (1825 - 1899). > To the Hans Giegengack Lineage. Moritz Giegengack, born in about 1628, left Kleinschmalkalden and moved to Roßdorf. His descendant Valentin Giegengack born in Roßdorf in 1750, went to Denmark, where he died in 1798. His offspring lives in Germany and the Netherlands. All Dutch Gigengacks and the Bocholt Gigengacks (both spelled with 'í') are from this branch. > To the Moritz Giegengack Lineage. We found information about the birth of Anna Gi(e)gengack, daughter of Baltahasar Gi(e)gengack. Her birth is registered in Fambach, Thüringen, a village about only 19 km from Kleinschmalkalden. Also see the Hanss Giegengack minor lineage here. > To the Baltahasar Giegengack Lineage. The name is written with 'ei'. We see Johannes Geigengack (1740 - 1823) and Johann Andreas Geigengack (1745 - 1812) who can be brothers, but we are not sure. Descendants still live in Germany. > To the Johannes Geigengack Lineage. Top-image: 'View from Röder (?)'. Underneath from left: 'Railway bridge', 'Church' and 'Hohe Warte' [mountain with observation tower close to Kleinschmalkaden]. 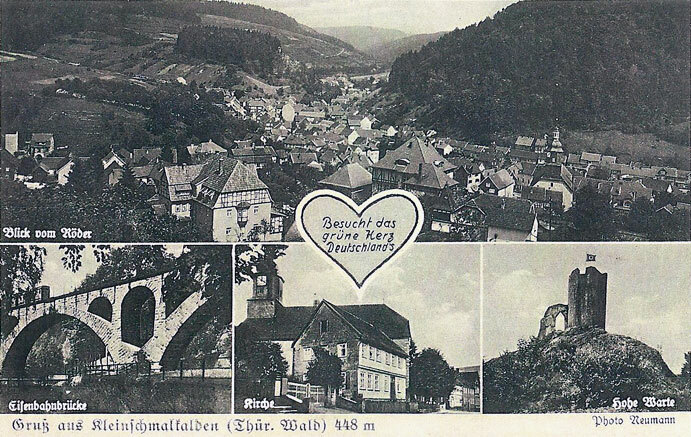 Bottom: 'Greetings from Kleinschmalkalden (Thuringia wood), 448 m. Photo Neumann'.